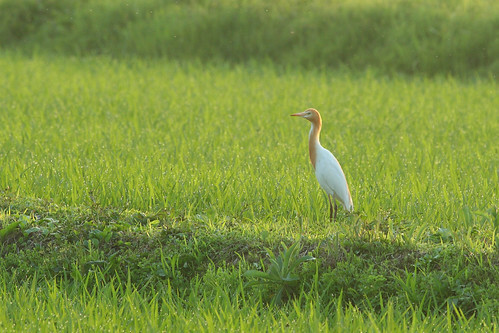 Cattle Egret in summer plumage just outside Kamiso. Not a great photo but a nice find, this one (like most egrets) is fairly scarce in Hokkaido. I've seen many of these around the world but this was only my second in Hokkaido..........although I saw my third yesterday near Onuma. This has been the only one in summer colours. I've seen this species in great numbers all over the world but it seems kind of exotic here in Hokkaido. I'm looking forward to autumn already. That egret really is in summer plumage, very colourful. Another 7-14 days and autumn will be in full swing here I reckon, especially if we get the usual tail end of US hurricanes. Good compositionm, Stu. I too like to show a bit of the habitat when ever possible. Our 100-400 is perfect for it! The surrounding looks like a paddy field,reminds me of my own place. Nice photo!